If you’re looking for that perfect bottle of vino, you’ve come to the right place! As the largest wine producing region in the U.S. east of California, we boast over 130 wineries, plus wine tours, wine festivals and wine bars. And you can&apos;t forget about our wine trails (five of them, to be exact): Cayuga Lake Wine Trail, Seneca Lake Wine Trail, Keuka Lake Wine Trail, Canandaigua Lake Wine Trail and Lake Ontario Wine Trail – meaning your next glass is just a hop, “sip” and a jump away! The 11 finger lakes create a microclimate that provides ideal growing conditions for our vineyards. Nod to Dr. Konstantain Frank’s Vinifera Wine Cellars in Hammondsport, who ignited the “Vinifera Movement.” Based on Dr. Frank’s time and dedication through the 1950s, the Finger Lakes Region is able to successfully support the growth of the European vinifera grape varieties in the region’s cold climates. 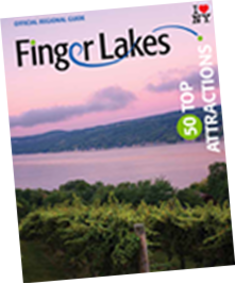 Due to these achievements, the Finger Lakes is known for its Rieslings and other world-class whites comparable to European wines. But don’t let that fool you, we’ve been making a name for ourselves with delicious, deep-bodied reds as well. Our wineries range in personality and style but all are guaranteed to pour a delicious glass of wine and provide a serene view. Charming family-run wineries tucked away in green vineyard valleys share personal stories and successes, such as boutique wineries Heart & Hands Wine Company in Cayuga County or JD Wine Cellars in Wayne County who produce small, handcrafted batches with intense focus on high quality. Bold, modern buildings and large rustic barns such as Ryan William Vineyard’s Tasting Barn in Schuyler County and Fox Run Vineyards in Yates County overlook picturesque lakes – with wines as memorable as their views. There’s always something exciting taking place at our wineries – whether it’s a private tasting or tour, yoga instruction, live music, or special event, like the popular dog festival Woofstock at Americana Vineyards in Seneca County. Pro Tip: Summer and fall are pretty busy for our wineries. For a more relaxed, intimate experience with winery staff, consider a visit during winter and early spring.